Pacifica has the pod design. For somebody who likes to be part of a group, it would work well because everybody tends to gather into a common area in front of each one of the units. However, with my father, who is independent, it is not going to match. He is not somebody to sit out there and be part of a large social group every day. Also it is farther away from the Seattle location where we really wanted to be. The layout wasn't quite what we were looking for, but it was a nice community. Pacifica Senior Living Lynnwood was a small community. I liked the socialization possibilities and how available it was and how easy it would be to mix with other residents there. They have mothers and nannies bring babies to come and service dogs come and interact with the people. They talked about day trips to go whale watching, and they have music, puzzles, and a big television in their great room. I visited Pacifica. I liked it that it had cottages with about 10 people to a cottage. They have activities there for my husband, like bowling. On Wednesday they have nannies and babies, where nannies bring over little kids to spend about an hour with the residents. Theyre working on trying to bring a petting zoo in there. My husband will be in a deluxe room, the largest room, but its totally empty, and theres nothing included except cable TV. He will move there in a week. Pacifica Senior Living Lynnwood is a very small community, and the people who work there are very friendly. The grounds are nice and very well-kept with lots of trees. It's a park-like setting. They have activities every day going on, some days they have numerous activities, they have outings, and they take them to their doctors' appointments. The room is a nice, small studio with a bathroom inside and a door going to the outside. It's also reasonably-priced at $3,195. The food looked good, plus there's variety. Pacifica Senior Living Lynnwood deals with moderate to severe memory loss. The facility had small individual cottages for roughly eight to 10 people to offer closer supervision and closer community for people and help them manage a smaller environment than a big building. The cottages were clean, pretty, and recently renovated. They had some cottages on the left side with a fence in between them and the ones I visited, so they had a section for severe memory loss in a gated area. We are very disappointed with Brookdale Lynnwood. I moved my father-in-law here from a much nicer Brookdale community. He has a very small room and basically no choices for the meals. The cooking is done in a separate cottage and then brought to them in carts, so sometimes the food is cold when it gets to them. They don't salt the food. They don't have locks on the doors, so there's no privacy. He calls the food "P.O.W. food." I have to give credit to the people because I think they are taking pretty good care of him. He likes the exercise classes. The management tells you exactly what YOU WANT to hear. What I got was something entirely different. With no notice, my father was moved to another room after only 2 weeks and charged an additional $500 per month. Clothes, shoes, personal belongings, etc., were constantly being taken- sometimes returned, sometimes not. One afternoon I found him soaking wet. When I found an aid, she simply said, "I guess I forgot to put on a new brief when I changed him." Frequently his bed was missing a sheet, top or bottom- maybe both. There were always clean sheets in his dresser drawer. The waterproof mattress pad was rarely on his bed. Although I had given 2 days notice, Emeritus did not use my emergency phone number when I was out of town for 3 days. When I returned home there was a message on my home phone -2 days in a row- that my father was "OUT OF DRUGS". I immediately called the nurse and she simply said they had not received them from the VA. I called the VA, they told me they had been shipped and gave me the tracking number. Emeritus still said they hadn't received the drugs. I called the Lynnwood Post Office, they checked with the mail carrier and he remembered delivering the package. Emeritus got very defensive but still insisted they "never got them". They were sent and delivered- What happened to them??? We saw a PBS documentary on Emeritus on T.V. that was frightening. I told a counselor at the VA about the "missing drugs" incident and also about the documentary. She looked up the documentary, was very alarmed and fortunately, was able to get him a room at a VA facility quickly. It has been 5 months and Emeritus still has not sent my father a complete refund. PLEASE! Watch the July 30, 2013 PBS Frontline Documentary of Emeritus, BEFORE you send your loved one there. The best way to get to know a community is by scheduling a tour. 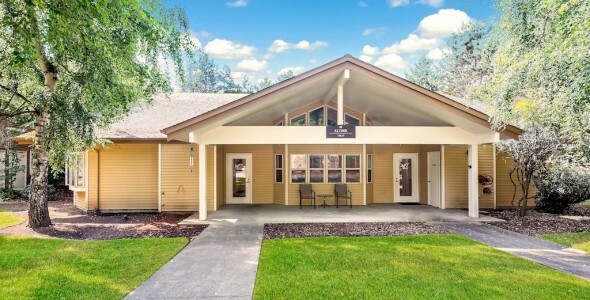 See the facilities, meet the staff and residents, and get a feel first hand what it's like to live at Pacifica Senior Living Lynnwood Assisted Living. Pacifica Senior Living Lynnwood offers a homelike setting and cheerful smiles from our professional staff who greet you every day. Our caring staff offers the assistance you need while respecting your independence. Pacifica Senior Living Lynnwood strives to create a lifestyle of independence, security and peace of mind for each individual and their family. We do what we love and what we truly believe in – provide compassionate, personalized care services that ensure dignity and respect. Our dedicated, professional team supports each resident and goes above and beyond to help them feel at home. Our peaceful setting, restaurant-style dining experience, activities and beautiful surroundings combine to create a wonderful living environment every day. Our genuine, caring staff, home-style meals and daily activities add to our residents' daily experience. They will tell you they appreciate all the options while living at Pacifica Senior Living Lynnwood. The sense of community is all around you when you become part of our family at Pacifica Senior Living Lynnwood. Through special events, activities, clubs and on-going cultural enrichment programs, we offer unlimited opportunities for you to get to know other residents and us.